Hope Jacare Designs: Polkadoodles need new doodlers! 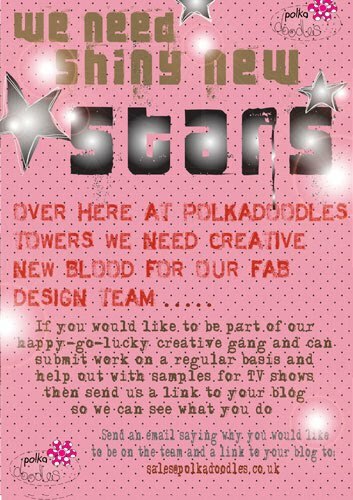 Go on give it a go - I can vouch for them being a fabby team of girlies to work with over at Polkadoodles! Send an email to Nikky...telling her why you want to join the Polkadoodle Team and add a link to your blog! Closing Date for entries is Friday 27 November at 12.00GMT. Good luck!! I wish I had time to apply for this, I love the CDs, but I can't take any more DT work on at the mo. Hope Nikky finds the right person to showcase her fabby work.